In an early indication of the government’s thinking about the shape of Australia’s emissions trading scheme, the Treasurer Wayne Swan has guaranteed that none of the money it raises will go into consolidated revenue. “Every cent” raised from the sale of emissions permits would be used “to assist either households or the business community with the impacts of this scheme,” he told the Channel Nine Sunday program. “There is no doubt that there will be some revenue raised and it won't be used for any other purpose other than to ensure the scheme has integrity and those people who need assistance, will receive it,” the Treasurer said. His remarks are first indication of the government’s thinking about the likely design of the scheme which is being kept under wraps until Wednesday July 16 when it will be outlined in a green paper to be launched by the Climate Change Minister Penny Wong at the National Press Club. The report said that should petrol be included in the scheme, the subcommittee had decided that petrol excise would be cut to offset the resulting price increase. Mr Swan said Cabinet had “not made that decision this week”. “We have not reached our final positions, that is what the Cabinet is doing at the moment, but all of our approach will be outlined in the green paper,” he said. Pressed as to whether petrol would be included in the scheme as will be recommended by Garnaut Review of Climate Change which reports on Friday the Treasurer replied: “I am not ruling anything in and I am not ruling anything out”. The Opposition Leader Brendan Nelson said yesterday that if petrol was included in the scheme put forward by the government it was “highly likely” that the Coalition would oppose it. “I suspect there is a high probability that we will not support what the government may actually choose to do,” Dr Nelson told the Ten Network. “We are Liberals - we generally believe in market solutions, and that’s why we supported an emissions trading scheme in government, and we believe that's the way to go forward. But in terms of also principle, it is extremely important, particularly when petrol is around $1.70 a litre, that the Government in its policies and implementing its policies in relation to climate change, does not as a direct result of the introduction of them, increase the price of petrol,” he said. The emissions trading is due to start in mid-2010, with the final outline of the legislation in place by the end of this year. Dr Nelson said that the timetable was too tight. One of Australia's leading ecobloggers will be blogging no more - until next year. Andrew Leigh is going to work for the Treasury as its Social Policy advisor for the next six months. In a similar manner to the former HSBC Financial Markets economist John Edwards who is working as its Financial Markets advisor. The Treasury is hiring well. It is going to do good things. The results of the Canberra Times mini-survey are in, and you can read them by clicking on the attached graphic. The ACT will survive its present downturn, returning to economic strength in the year ahead, according to a survey of eight leading forecasters conducted by the Canberra Times. But they expect the Australian economy as a whole to slow and both ACT and national unemployment to rise. Three of the eight economists surveyed expect interest rates to climb further in the coming financial year. Its State Final Demand (a measure of spending and investment) went backwards in the March Quarter - sliding 0.3 per cent in contrast to every other state and territory in which demand advanced. A second consecutive slide in demand would put the ACT into what is known as a demand recession. In the year to March the ACT economy scarcely grew at all according to the Bureau of Statistics, with state final demand climbing a mere 0.05 per cent. By contrast national demand soared 4.8 per cent. But in the coming financial year the forecasters expect ACT final demand to bounce back, surging ahead 2.2 per cent. ACT demand growth would still be lower than the expected national average of 3.0 per cent, but would be well away from the edge of recession. The forecasters expect Australia’s overall rate of economic growth to slow from its present 3.6 per cent to 2.6 per cent by July 2009. The most pessimistic forecasters, the ANZ bank and TD Securities, expect the Australian economy to grow by only 2 per cent. The most optimistic forecaster, BIS Shrapnel, expects it to maintain its current momentum at 3.4 per cent. Every forecaster surveyed expects a modest jump in Australia’s unemployment rate, from its present 4.3 per cent to around 4.8 per cent. Only one, TD Securities, expects Australia’s unemployment rate to climb above 5 per cent. Both of the forecasters that attempted to predict the ACT’s unemployment rate expect it to climb from its present 2.7 per cent; one expecting 3 per cent, the other 3.5 per cent - rates that would still be better than the national average. The ANZ Bank is expecting a sharp lift up in official interest rates, predicting two further rate hikes from the Reserve Bank that would lift the cash rate from 7.25 per cent to 7.75 per cent. It expects both of those hikes to take place before the end of the calendar year. Commonwealth Securities and BIS Shrapnel expect just one interest rate hike of 0.25 per cent, also before the end of this calendar year. Four forecasters expect interest rates to remain steady. Only one, TD Securities, is expecting lower interest rates. The firm’s Joshua Williamson says he expects the Reserve Bank to cut interest rates twice - once during the current calendar year, and once during the first half of next yeasr, bringing down professional interest rates by a total 0.50 per cent. But he says he doesn’t expect all of the cut to be passed on by mortgage lenders, who he says are likely to cut their rates by 0.4 per cent. All of the forecasters expect some moderation in Australia’s underlying rate of inflation, at present at a long-term high of 4.3 per cent. However only one, BT Securities, expects it to move back to top of the Reserve Bank’s 2 to 3 per cent comfort zone by the end of the financial year. Most expect the Australian dollar to fall back from its present long-term high of 96 US cents. Only one Westpac expected it to climb further, reaching 99 US cents by mid-2009. Sunday dollars+sense: Why do prices end in nines? When you go out looking for petrol today what do you expect to pay? Will it be 169.9 cents per litre, or perhaps 164.9? Whatever the price, it is certain to end in a nine. But why, when we all know that for practical purposes 169.9 is 170? Surely it can’t be because we’re all fooled into believing that we are paying a lower price? The reassuring news just published in the journal Psychological Science is that there’s something more basic at play. When selling engraved gravestones in the 1970s my grandfather used to add up each of the individual costs and present the bereaved customer with an exact - if over-precise - figure. Professors Chris Janiszewski and Dan Uy from the University of Florida believe that he knew what he was doing. To test their theory they asked a number of volunteers to guess the wholesale price of a hypothetical plasma TV. One group was told it’s retail price was $5,000, another was told it was $4,988, another: $5,012. The lowest wholesale price was picked not by those who had been given the lowest retail price, but by those who had been given the roundest: $5,000. As the professors see it, we begin with an anchor in our mind – the quoted price – and then move away from itin increments. But the increments are smaller the more precise is the starting price. As they put it, if we see a toaster priced at $20, we might wonder whether it should really be $18 or $22. But it we see a toaster priced at $19.95, we might wonder instead whether it should be $19.75 or $19.50. They checked out their theory using Florida real estate prices. They found that sellers who listed their homes more precisely using a figure such as $494,500 got a better price than those who quoted a round number such as $500,000. And the houses that had been on the market for a couple of months lost less of value when the asking price seemed precise than they did when it seemed round. So please don’t think badly of your service station or your supermarket when it quotes you a prices ending in 99 cents. They’re not doing it because they think you’re a mug. Or at least not in the way that you had probably thought. Australia's Rio Tinto used to find it hard to give away some of the iron ore it pulled out the dirt in the Pilbra. This week it scored a near doubling in its iron ore selling price - on top of the doubling it has enjoyed since 2004. Its critics say it could have got even more. On the outskirts of Melbourne Australia’s biggest tyre factory this week declared that it had to close, throwing 600 Australian workers onto the streets. Its owner, Goodyear, is able to import tyres for much less. And in Canberra the Treasurer Wayne Swan opened the door to tightening Australia’s previously very liberal foreign investment regime by suggesting that state-owned corporations might face tougher restrictions than purely private investors. The common link in these three very different stories is China. And this week wasn’t too different from any other. Overseas we learnt that China now has more internet users than does the United States. It has twice as many mobile phone users. Its population of millionaires jumped 20 per cent in the last year. Its billionaire population doubled. It is undergoing a seismic shift: a once-in-a-planet event a bit like the ending of an ice age. Much of the world will find itself hurt by the shockwaves. Not Australia. Most probably. But even we will have to make adjustments. “Taking China and India together, roughly half the planet is becoming modern,” he says. The ANU’s Warwick McKibbin, an academic economist so highly regarded that he is only one who sits on Australia’s Reserve Bank board, says we are witnessing a sudden jump in the China’s standard of living to western levels. He expects it to be complete by 2100. For the past 400 years it has been pitifully below those levels. As recently as 2003 citizens of the United States earned $US25,000 on average. Citizens of China earned $4,800. But McKibbin points out that a sudden jump to parity would actually do no more than restore China to its former place, the one it enjoyed for the first 1,600 years of the modern AD calendar. “In year zero, China and India had 58 percent of the global population and 59 percent of global GDP in that year; and the respective numbers in year 1600 were 53 percent and 52 percent,” he says. But much slower growth in the past four centuries has pushed them way behind. Things began improving as China and India began to open up their economies to the rest of the world at around the start of the 1990’s. What’s under way right now is the last dramatic lift in their standard to living to the best the world has to offer. In 2003 China accounted for 20.5 per cent of the world’s population and but only 15 per cent of its income. McKibbin expects it to make 20 per cent of the world's income - population parity – by 2100. He expects India to get there by 2150. The maths make it seem inevitable. Chinese income is growing at the rate of 10 per cent a year. India’s is growing at 8 per cent. Singapore, once regarded as a less-developed country that Australians visited for cheap holidays, now enjoys a standard of living more than a third higher than Australia’s. It is the fifth richest nation in the world in terms of purchasing power per citizen - just behind Qatar, Luxembourg, Norway and Malta. Australia is in 20th place, not too far away from Japan, another country that just 50 years ago was impoverished by comparison. Singapore’s transformation began when it was expelled from Malaysia in 1965. Japan’s gathered pace after the second world war. It is a question Austrade’s Chief Economist Tim Harcourt has been pondering on each his repeated visits to a nation he says is changing almost beyond recognition each time he visits. “We expected it to grow quickly and we keep forecasting that, but each year our forecast have been overtaken by what’s been happening on the ground,” he says. “But what made it happen, what switched it on?” I ask, somewhat naively. “The Party. It makes broad announcements, like – we’re going to build the west, or become more green and so on, and off they go,” he replies. Much of the foreign money that China is accumulating as a result of exports is simply being stored. China’s foreign exchange reserves, worth $US30 billion back in 1990 are now worth $US1,760 billion – and are said to be accumulating at the rate of $US100 million per hour. It is enabling China to lend money to fund the world’s debtor nations, such as the United States and Australia. Australian and US home loans, once the result of domestic savings, are now likely to be “made in China”. Countries such as the US and Australia can console themselves with the knowledge that it is quite likely to be their own money that they are borrowing back. They sent it over to China in return for well-priced goods. But the money is controlled by China – often by its Communist Party government. Should China want to, it could pull the plug on debtor nations such as the US at any time by simply refusing to refinance their loans. It is a power that it has shown no inclination to exercise, but one that it has only enjoyed for the past few years. More worrying for Australia in the meantime is the use to which Chinese state-owned investment corporations are putting their newfound investment powers. They are attempting to buy up Australian resource companies. They even had a go at Rio Tinto itself earlier this year. In play at the moment is the West Australian iron ore miner Murchison Metals, facing a bit from China’s Sinosteel. On Thursday the Treasurer Wayne Swan indicated that while he welcomed investment from China, he would protect the national interest amid reports he was planning to limit investment bodies owned by foreign governments to 49.9 per cent stakes in local firms. If China succeeded in a bid for a company such as Rio Tinto it is easy to imagine that Rio Tinto would find itself settling for smaller price rises for Australian commodities than the 85 per cent increase in the price of iron ore it announced on Monday. There’s more to it than iron. China’s appetite for copper seems insatiable. Each new Chinese city apartment eats up kilos of copper wire. Its new power stations and transmission lines use much more. It is already buying one quarter of all the copper produced in the world each year and its consumption of copper is growing at the rate of 13 per cent per year. Its demand for copper, lead, iron ore, liquefied natural gas, uranium and wheat – all produced by Australia – appears insatiable. Oil appears to be about the commodity that Australia is unable to supply to China, along with thermal coal in which China has until now been self-sufficient. That self-sufficiency is about to end, and as a result Australia’s Bureau of Agricultural and Resource Economics is forecasting a doubling in its price in the next twelve months with Australian income from thermal coal sales jumping 70 per cent. The forecasts, released on Monday suggest that Australia’s income from coking coal will jump a further 123 per cent, our income from iron ore pellets will jump a further 72 per cent, our income from liquefied natural gas will jump 67 per cent and our income from alumina and aluminum will jump 20 per cent and 12 per cent. These price rises are on top of a jump of 40 per cent over the past four years in Australia’s terms of trade, which is a measure of the price received for exports as a proportion of the price paid for imports. The jump began at about the time as China began rapidly industrialising. The Treasury and the Reserve Bank are forecasting a further jump in our terms of trade in the coming financial year of 20 percent, which with compounding will result in a 70 per cent jump over five years. The reserve Bank Governor Glenn Stevens told a closed Treasury seminar in March that Australia was living through “one of the largest transformations in the structure of the global economy, as far as Australia is concerned, for a century”. “But while the Korean War boom of the early 1950s was temporary, all the indications are that the rise of China is not just a cyclical event, but a structural change of the first order,” he said. Alone among industrial nations Australia produces almost all of the things that China needs in order to lift itself up to a Western standard of living. Australia’s terms of trade have climbed faster than those of any other nation in the four years of China’s rapid industrialisation. Only oil-rich Norway has come close. Canada has been a distant third. The United States and Europe have good reasons to fear the consequences of China’s rapid industrialisation. It is permanently increasing the prices of commodities such as oil that they need. And by selling good products cheaply, it is hollowing out their local industries. It wasn’t that long ago that US congressmen were smashing Japanese radios in protest at what they were doing to US manufacturing. Thanks in part to the farsightedness of a former Australian Ambassador to China Ross Garnaut, Australia has already lost many of the firms that would have suffered as a result of China’s industrialisation. As Prime Minister Bob Hawke’s economic advisor in the 1980s he drove the tariff cuts that helped move some of those firms to China early. If the 19th Century belonged to Europe, and the 20th Century belonged to the United States, the 21st is likely to belong to China. And as unsettling as many of us may be finding the transition, it is taking us along for the ride. "MOTORISTS will be spared an increase in the price of fuel under the emissions trading scheme being thrashed out by the Federal Government.As a special climate change subcommittee of cabinet met again yesterday, followed by a full cabinet meeting, senior Government sources told the Herald that the starting point was that there be no net increase in the price of petrol. "We are not going to do people over," one senior minister said. The Government's price commitment indicates that should fuel be included in the emissions scheme, petrol excise would be cut to offset the increase caused by the imposition of a carbon tax. Another option is to defer the inclusion of petrol until after the election scheduled for late 2010." Also today, in the Telegraph Laurie Oakes sums up the decision-making dynamics. Here's why I think petrol should be included in the scheme. It has to do with low-hanging fruit. An awful lot will unfold over the next few days. Professor Ross Garnaut will release his draft report this Friday July 4, 2008 at the National Press Club. ABC TV will broadcast it live from 12.30pm. On the day before, Thursday July 3, at the ANU climate change modeller Warwick McKibben outlines his (very different) ideas. Then a fortnight later on Wednesday July 16, the Climate Change Minister Penny Wong unveils the government's emissions trading Green Paper at the National Press Club. ABC TV will also broadcast this live from 12.30pm. And living in Canberra, Australia's best city, I get to go to all three on your behalf. Lucky, aren't I? "Parentonomics lays bare what most sleep-deprived parents only dream about. Forget about inflation and unemployment. Here an economist uses game theory to tackle really important topics, such as toilet training and fussy eaters." 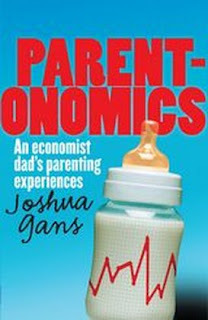 Melbourne Business School Professor Economics Joshua Gans new book will be out in six weeks. He reports that he is selling the first copy on Ebay (here) to raise money for the MS Readathon. The latest bid, tonight (Saturday) is $316.00. "I have to tell you that your child is a delight." "Yes, she does everything she is told. She is always ready at the beginning of class with her diary on the table. She works hard all day at projects. And she always helps clean up." Turns out that we were talking about the same child, physically at least. At home, 'compliant' is not the word I would use for Child No.1. Sure faced with the inevitable, she is very good and does most things without being reminded. But on anything extra, well, it is a struggle where she clearly believes that if she complies she might be doing whatever distasteful activity it is for the rest of life. Actually, she is probably right about that. Nonetheless, let's face it, we can't complain. If we are going to have compliance somewhere best that it be at school. Indeed, we rewarded that by allowing her to have more of a free reign with her time at home. "Well, of course I am well-behaved. They pay me there." "We get money. Well, not real money but bonus money. I have the most in the class." Ah ha, so once again she proves that she is her father's daughter. At school they get the price right which is clearly not the case at home. Nonetheless, I don't think we are going to change things here, lest we upset the current happy situation at school. Ken Henry is taking five weeks holiday. This is big news, according to this morning's Daily Telegraph. "THE man at the helm of Australia's troubled economy will leave his post for nearly five weeks to look after a colony of endangered wombats. Ken Henry, the Treasury Secretary, will miss an important Reserve Bank board meeting and be without a mobile phone as he ventures into remote Epping Forest National Park in central Queensland. The money shot is the photo. Wow! The ACT is officially Australia’s jobs paradise – the only state or territory in which there are more jobs on offer than people available to fill them. The latest job vacancy figures released by the Bureau of Statistics show there were five jobs on offer for each four Canberra residents unemployed in May – making the ACT by far the tightest labour market in the country. By contrast in the two so-called ‘boom’ states of Queensland and Western Australia unemployed people outnumbered vacant jobs two to one. In NSW and Tasmania unemployed residents outnumbered vacant jobs three to one, and in South Australia, five to one. Vacancies climbed by 3.4 per cent in the three months to May, with private sector vacancies were up 3.6 per cent and public sector vacancies up 1.2 per cent. Nationwide there are just 2.6 unemployed people vying for every vacant job – a near record low. In the ACT the number of vacant jobs exceeds the number of people wanting them. There are 5,600 vacant jobs for 4,618 unemployed residents. CommSec economist Savanth Sebastian said the results suggested that the recent rate hikes had not succeeded in slowing employers demand for workers. “There are plenty of opportunities for workers in the current environment, if they have the right skills. And with the skilled migration boom picking up pace the unemployment rate is like to remain not far from the recent record lows in coming months,” he said. The news will enable the ACT government to claim that although the Territory’s economic growth is the lowest in the nation, for the moment it remains the easiest place in which to find work. The vacancies survey released yesterday will be the Bureau’s last. The Bureau of Statistics has axed the survey in order to find $22 million in savings in order to cope with budget cuts. Graeme Samuel outlined it beautifully in an (unreported) answer to a quesion at the Press Club yesterday. I typed it up with a view to using it in the Canberra Times, but didn't. So I am posting it here. The head of the ACCC is in no doubt that FuelWatch will help. I think he makes an open and shut case. "At 9.00am this morning in Sydney the difference between the highest and lowest price in petrol being charged in the city metropolitan area was 19.5 cents. And what I can also tell you is that 68 per cent of service stations in Sydney at 9.00am this morning were selling petrol below 158.9 cents. The problem is – I can’t tell you which service stations. I can’t tell you where they are, and I can’t give you any more information. When I say “you” I mean all consumers. They can’t get that information. They have it on their computer screens in their head offices. They can tell you which service stations are selling at 169 .9 (the highest level), which are selling at 150.4 (the lowest level), and they know how to adjust their prices through the day, minute by minute, to reflect what their competitors are doing. It certainly a very cozy arrangement. It is as close to an illegal collusion as you can get, but it is not illegal, and I emphasise it is not illegal on our analysis. What FuelWatch will do is tell you, the consumer, where you can buy the petrol at 150.4. It will also tell you where you can buy at 169.9, and I guess I can make a pretty good guess which service station you avoid. And which one you will intend to buy your petrol. More importantly at 2.00pm each day every retailer of petrol will have to make a very tough decision. What price am I going to charge for petrol tomorrow? I’ve got to post that price by way of secret tender onto a website in the ACCC, and I’ll be stuck with that price. If I get it wrong, if I have actually set my price at 169.9, not 150.4, the biggest variable in Sydney today, I can’t adjust it. I won’t have the benefit of that computer screen to enable me to adjust it. I’ll be stuck with that for 24 hours. I guess the service station that’s selling at 169.9 might find very little trade through the day as the consumer is knowing exactly which service station it is, and what the real prices are that are available in alternative service stations. That’s what Fuel Watch is about." Want to confess to being part of a cartel? Take a number. Businesses are literally queuing up to confess their involvement in illegal cartels, approaching the Australian Competition and Consumer Commission for immunity from prosecution at the rate of one per month. The ACCC Chairman Graeme Samuel revealed the figure in an address to the National Press Club yesterday in which he called for jail terms as a punishment for business leaders found to have colluded to raise prices. “There is great alarm at present at the rising cost of essential consumer goods, most notably petrol and groceries,” he told the Press Club. “Their legal advisors ring up and say ‘we want to confess’, and we have to say ‘sorry, you‘re too late, you’ve been beaten by someone else, so you will face potentially full prosecution unless the person or persons - and you don’t know how many there are in the queue in front of you - fall over, either through lack of cooperation, or being shown to be the real leader of the cartel’”. The ACCC has 21 alleged cartels under investigation, about half of them resulting form information provided by business figures seeking immunity. Another six are in court. Mr Samuel wouldn’t comment on proceedings currently underway against the former head of the Visy cardboard packaging company Richard Pratt who faces up to four years jail for lying about his knowledge of a cartel. But he did say that the case against Visy came to light because its co-conspirator Amcor “came in and said look, we have discovered that there has been a cartel in operation, we will tell you the lot”. So successful had been the immunity policy that Mr Samuel was being approached by businesses that in fact had done nothing wrong. “People will come and confess to us a cartel, which is truly is not a cartel,” he said. The Chairman said that the behaviour of petrol stations that exchanged information about prices came close to being an illegal cartel. Australia’s love affair with mobile phones has scaled new heights. According to the Australian Mobile Telecommunications Association a record 10,056,640 mobile phones were shipped to Australian stores in the year to May – the first time annual sales have passed 10 million. The figure suggests that one in every two Australian has bought a new mobile phone in the past year. “Australians love tech goods like mobile phones, computers and iPods and there are no signs of mobile phone sales reaching saturation point,” he said. The Australian launch of Apple’s iPhone next month should boost sales further. Labour market specialist and all-round macroeconomist Barry Hughes used to advise the former Treasurer Paul Keating and several state Labor Premiers. He was part of the 1983 decision to float the Australian dollar, among many things other things. A few years before that he lectured and tutored me in economics. He served on the Keating government's Working Nation inquiry which in the early 1990s recommended that Australia shoot for an unemployment rate as low as 5 per cent when such a thing seemed unattainable. Today in the smh he argues that we shouldn't stop at 5 per cent. More disturbingly he makes a pretty strong case that is exactly what the officials who work for the Rudd Labor government are doing. Odd, eh? "Nearly 30 years ago I wrote a book called Exit Full Employment. In the 1960s and early 1970s unemployment had to fall to 2 per cent before it was considered full employment. But what about now? Leading bureaucrats have broken cover to declare something close to 5 per cent as the new full employment. On June 13 the Reserve Bank boss, Glenn Stevens, came out of the closet to declare the economy "pretty fully employed". The bank is coy about unemployment, except to admit numbers will rise, but Treasury is a little more forthcoming. The budget says measured unemployment will rise from February's 4 per cent to 4.75 per cent by June next year, and by a little further subsequently, although this has to be inferred from surrounding forecasts. Hidden unemployment is expected to rise appreciably, too, as discouraged workers drop out of the labour force. Why is this happening to a resources-rich country? At a political level it is strange to see John Howard, who last year contemplated unemployment in the threes, being more ambitious on jobs than the new Labor government. Perhaps Howard was economically naive, but are the Prime Minister, Kevin Rudd, and the Treasurer, Wayne Swan, aware of what their Government is projecting?" The shape of Australia's planned Emissions Trading Scheme has been thrown into doubt with both the Government and the Opposition refusing to by refusing to say whether it should cover petrol. Until this week, a broad-based scheme including transport fuels had bipartisan support. Since then petrol prices had “gone through the roof” and it had become clear that carbon prices would have to be higher than had been thought. A $100 carbon price, if fully applied to petrol would add 25 cents a litre to the price. But when asked by the Canberra Times whether the government would include petrol in its own scheme she three times refused to answer. Senator Wong said first that the Government had “made it clear from the start that those decisions, including coverage, are decisions we will make in the coming months”. They would be canvassed in a Green Paper to be released next month. Asked again to confirm that petrol would form part of Labor's scheme she said that the Opposition in government had set out an emission trading scheme which did include petrol but were now backing away from it. Asked a third time whether the government would include petrol in its scheme she said the Opposition was failing to live up to the task of economic responsibility. The government's Green Paper, due late next month will take into account the findings of the draft Garnaut Climate Change Review to be released Friday week. But the Garnaut Review, commissioned by the Prime Minister Kevin Rudd while Leader of the Opposition and conducted by the ANU economist Ross Garnaut, would be only one of many inputs into the Green Paper. “The Green Paper will outline Government’s thinking informed by a range of matters including Professor Garnaut’s report, including advice from within the government and of course including the consultations with business, with industry that government has been undertaking,” Senator Wong said. In Parliament the Infrastructure Minister Anthony Albanese appeared to lend support for including petrol in the scheme saying that the transport sector was responsible for 14 per cent of total emissions and must be a part of any climate change strategy. Tuesday Column: How is our tax system shrinking the size of houses? By making them more expensive. How often does an inquiry dominated by members of the Coalition sledge one of the Coalition’s own programs? The last time it happened was over the Access Card. That program was so disorganised, so counter to its stated aims and growing so much like Topsy as to be impossible to support. It looks as if the same can now be said about what the Coalition did to the price of houses. The report of the Coalition-dominated Senate select committee on Housing Affordability acknowledged last week what the Coalition’s critics had been telling it since 1999: That its decision to almost halve Australia’s rate of capital gains tax in that year enriched existing home owners at the expense of future ones. Reports this week of a new Brisbane suburb in which the houses have no real backyard, no laundry, fewer and smaller rooms and space for only one car illustrate starkly the new divide - the explosion in house prices that began in 1999 has sharply cut the lifetime buying power of future salaries. In what may have been an astute political judgment the former Prime Minister John Howard told us that he never heard homeowners complaining about rising prices. One of his parliamentary secretaries quipped “rising prices make for happy voters”. Before the change people buying houses as investments paid tax on any profits they made at a rate not far below their marginal tax rate. The rate was cut only to compensate for inflation, which was low at the time. After the change the rate was halved. High-income earners, normally taxed at 48 per cent, were henceforth taxed at only 24 per cent on the part of their income that came from trading in real estate. As before, negative gearing meant that payment of that tax was postponed until the real estate was sold, and that in the meantime investors could reduce their other income for tax purposes by reporting what would ultimately turn out to be fictitious losses. Lightly-taxed capital gains could also be made in other ways, such as through the share market. But real estate proved far more attractive to the new breed of well-advised tax minimizers. It was tangible, thought not to fall in price, and if it was in the form of a new apartment, could even attract a depreciation allowance (while appreciating in price). As the new breed of investors piled into housing they pushed up prices to record highs, knocking first homebuyers out of the way, or condemning them to Brisbane-style micro-housing. Those of us already in the real estate market might even have been cheering them on. The Senate Committee has found that the resulting boost in the wealth of existing home owners and the tax break granted to investors is costing the government $6 billion per year, dwarfing the $2 billion annual cost of the negative gearing tax concession and also the $1.5 billion per year which is spent on the Commonwealth-State Housing Agreement in an effort to shield home buyers from the worst of the damage. The committee found the $6 billion tax handout to be “regressive” as nearly all of it went to high-income households. It said that neither the United States nor the United Kingdom granted such a concession. The committee said that the most common argument used by supporters of the capital gains and negative gearing tax concessions was that together they increased the supply of rental properties and kept rents lower than they otherwise might be. It is a difficult argument to make given that rents have soared since the concession came in. In evidence sworn before the committee the Department of Families, Housing, Community Services tried. One of its senior officers said that “the taxation provision for negative gearing has demonstrably increased the amount of rental housing that is available in the broader market”, but under later questioning conceded that the Department did not have “any information from our own sources” to support the contention. The Coalition-dominated committee recommended that the tax inquiry to be chaired by the head of the Treasury Ken Henry consider the implications of the concessions for both housing affordability and fairness. Its report reads as if just about bandaid that has been applied to blunt the effect of the concession on prices has in fact made it worse. It quotes the Reserve Bank as saying that in the present circumstances programs that give people more money to spend on housing simply push the price higher. One such program is the $7,000 First Home Owner Grant. The committee recommends cutting it for buyers of existing houses, while increasing it for buyers of newly constructed homes. It has the same concerns about the Rudd government’s planned subsidised first home saver accounts. The Committee stops short of making that finding about stamp duty concessions, although it notes that others have. On Friday Westpac published its analysis of the effect of the latest round of extra stamp duty tax concessions in the Victorian, Queensland, South Australian and Western Australian budgets. It found that combined they would force up national house prices by an extra one a per cent, with Queensland prices forced up an extra 2 per cent. Westpac found that the original first homebuyer became “priced in” to real estate values within six months. A recent stamp duty concession in Western Australia became priced in three months. The ACT stood alone with NSW in not widening stamp duty concessions in its last budget (except for an innovative and temporary concession for pensioners wanting to downsize). The ACT Opposition has promised to scrap stamp duty for first homebuyers. Westpac believes that’s a bandaid that would push up prices. There is no easy way to make houses more affordable for people not yet in the market without acknowledging the root of the problem, tackling it and making prices fall. The Coalition-dominated inquiry is to be commended for acknowledging part of the problem that its side of politics created and challenging the Rudd Government’s tax inquiry to fix it. The Opposition has challenged the Prime Minister to rule out adding an emissions charge to the price of petrol at the same time as a new study has found concerns about the impact of a charge to be overblown. A study by the CSIRO for the Climate Institute released this morning has finds that a carbon price beginning at $15 a tonne and increasing to $100 would increase petrol prices by up to 61 per cent by 2050. However it finds that petrol should be more affordable by then because real wages should have increased 104 per cent. Mr Rudd declined to say whether petrol would be excluded from the scheme. it ahead of other countries in the Asia-Pacific. The approach marks a departure from the policy that the Coalition took to the 2007 election, which was to introduce an emissions trading scheme along the lines recommended by the previous Prime Minister’s taskforce without waiting for other countries to do the same. It also represents a departure from an explicit promise by the previous Environment Minister Malcolm Turnbull and the Previous Prime Minister John Howard to include petrol in the emissions trading regime. The CSIRO study finds that the emissions trading scheme to be introduced from 2010 will have only a modest impact on most household budgets as wage growth outstrips increases in energy prices, actually improving energy affordability. In the most likely scenario modeled the average amount of income required to meet current energy needs is projected to fall from just above 9 per cent to around 8 per cent. Among low income groups energy is expected to be become less affordable if energy use remains unchanged, but more affordable if energy efficiency improves. The study finds that budget payments of around $350 million per year will be needed to fully insulate low income groups from increased petrol and electricity prices. “For low-income families, concerns about the increased cost of energy and other goods and services are real but can be overcome if we have a fair and effective distribution of the multi-billion bonus to government coffers provided by the emissions trading system,” said Erwin Jackson, the director of research at the Climate Institute. The recommendation mirrors one expected in the interim report of the Garnaut review of climate change which will be released next week. Want to know how much more money is about to come into Australia? The forecasts out today (big pdf) from the Bureau of Agricultural and Resource Economics are stratospheric. Our income from coal should double in the year ahead, our income from iron ore should increase 72 per cent in one year. This is the upside, for us, or the worldwide oil and food price boom. It is what the Reserve Bank and the Treasury have been worried about. It makes talk of recession seem off the pace. Soaring food and energy prices are set to boost Australia’s economy far more than they hurt it in the year ahead, adding an extra $70 billion to the nation’s income. As petrol prices yesterday hit new highs across all Australian states, averaging 161.4 cents per litre, Australia’s leading commodity forecaster predicted an export bonanza in the coming financial with commodity export income jumping 40 per cent. The Australian Bureau of Agricultural and Resource Economics Earnings expects earnings from mining and farm exports to top $212 billion in the year ahead, up from $151 billion in this financial year. The forecasts are an advance on those released by the Bureau in March that predicted a 30 per cent increase in commodity export income. They weight to concerns in the Treasury and Reserve Bank that Australia may be in for a new round of spending-fuelled inflation that will require still higher interest rates to contain. Earlier this month the Reserve Bank Governor Glenn Stevens warned that he expected a 20 per cent increase in Australia’s terms of trade, which is a measure of the prices Australia receives for exports relative to the prices it pays for imports. “Since 2002, the total rise in the terms of trade will, by the end of this year, be of the order of 65 to 70 per cent,” he said. The Bureau of Agricultural and Resource Economics says income from Australia’s biggest export, so-called metallurgical coal used to make steel is expected to more than double in the coming financial year, jumping 123 per cent from $18 billion to $39 billion. Income from the sale of iron ore is set to jump 72 per cent from $21 billion to $35 billion. Income from the sale of thermal coal is expected to climb from $10 billion to $15 billion while income from the sale of liquefied natural gas climbs from $6 billion to $11 billion. Income from Australia’s limited exports of petroleum products is expected to climb from $1.6 billion to $2.8 billion. Most of the extra income is forecast to be the result of higher prices, with the worldwide price of metallurgical coal expected to triple over the course of the year. The volume of resource exports is expected to climb more slowly with iron ore volumes climbing 18 per cent and LNG volumes 15 per cent. Gold volumes are expected to climb 6 per cent. Wheat export volumes are expected to increase dramatically if improved rain holds, climbing 109 per cent. Volumes of wine and dairy exports are expected to climb 5 per cent and 4 per cent. Commonwealth Securities economist Savanth Sebastian said that the Bureau was forecast thing “the biggest annual increase in commodity exports in 40 years”. He said it would boost the entire nation’s income, “eventually filtering through the entire economy". “Interest rates are not going down any time soon and it is likely that one further interest rate hike may be necessary towards the end of the year to combat the expected pick-up in spending,” he said. Other figures released yesterday show that car sales slid 1.6 per cent in May, with sales of four-wheel drives slipping 4 per cent, the biggest drop for almost two years. The average Australian price of petrol has climbed 3 cents a litre over the last week to reach 161.4 cent, a new record high. The Canberra prices is averaging 162.7 cents. It's in beta, but what a resource! It lets you know what contribution any MP has made to the parliament, and whether, statisticially speaking, they speak crap. Political Opinion: Results from the Australian Election Study, 1987-2007. It is an indespensible 81-page political/social resource. Australian voters see big business as a greater threat than unions, think more should be spent on social services over tax cuts and say Peter Costello would not have saved the Coalition. Sunday dollars + sense: Where did all these bottles come from? What do you buy each time you reach into a shop fridge grab a 600ml bottle of water? About one-quarter of a bottle of oil, according to most authoritative estimate - taking into account the oil that has been used to make the plastic, turn it into a bottle, transport it to you and then take it away to be buried, burnt or recycled. And you are buying more water than you imagine: typically double what’s in the bottle when the water needed to cool and clean the bottling machines is taken into account. So how did it come to this, and why is it still like this when both water and oil are more scarce than they have ever been? That’s the mystery tacked by American author Elizabeth Royte in an engrossing new book entitled Bottlemania: How water went on sale and why we bought it. We didn’t used to buy bottled water in modern times, although we certainly did in earlier times when public water wasn’t safe. It began with Orsen Wells intoning in 1978 that “There is a spring and its name is Perrier.” Sales trippled on a campaign built not around thirst, but image. The advertisements used the pop star Madonna and pictures of waterfalls and mountains to imply that drinking bottled water was a “path to enlightenment - like practicing yoga or eating organic food”. Sales exploded from 115 million to 4 billion in seven years. Along the way there was help from a myth – that each of us needed to drink eight glasses per day. Royte traced it back to the food and nutrition board of the US National Research Council which once said that an adult needed one millilitre of water for each calorie of food. But the board also went on to say (these days unreported) that most of that water was already in the food we ate. Cooked rice and noodles are full of it. And there was a particularly nasty attempt to change the attitude of restaurant patrons. Waiters were trained to shame them into paying for bottled water, sometimes by forcing them to repeat the word “tap”. In Canberra, with tap water too good to bottle, we should be above that. The outrageous success of bottled water, in a country where more than 89 percent of tap water meets or exceeds federal health and safety regulations, regularly wins in blind taste tests against name-brand waters, and costs 240 to 10,000 times less than bottled water, is an unparalleled social phenomenon, one of the greatest marketing coups of the twentieth and twenty-first centuries. But why did the marketing work? At least part of the answer, I'm beginning to understand, is that bottled water plays into our ever-growing laziness and impatience. Americans eat and drink more on the run than ever before. The author Michael Pollan reports that one in three American children eat fast food every single day, and 19 percent of American meals and snacks are eaten in the car. Bottled water fills a perceived need for convenience (convenience without the calories of soda, that is): hydration on the go, with bottles that fit in the palm of the hand, in a briefcase or purse. According to research conducted by the Container Recycling Institute (CRI), between 1960 and 1970 the average person bought 200 to 250 packaged drinks each year-mostly soda and beer-and many of those were in refillable bottles. When I was growing up, my family drank only from the faucet and from family-size containers. We quenched our thirst, when out and about, with water from public fountains. Either that, or we waited till we got where we were going. On picnics, we might have a big plastic jug of lemonade, homemade. Sure, the grown-ups occasionally bought beer, but the idea of single-serve beverages were considered, by and large, frivolous. Today, the tap is just as alien to today's youth, who've grown up thinking water comes in bottles, taps aren't for drinking, and fountains equal filth. Kids like having their hands on a personal water bottle, but they have no interest in washing that bottle out, to be reused another day, or otherwise taking responsibility for their waste. Stores selling water are on every corner, while drinking fountains or restaurants happy to fill a glass for free are increasingly rare. "As refillables were phased out, as technology developed to enable single-serving plastic bottles, and as industry marketing efforts were ramped up," CRI reports, "packaged beverage consumption grew and grew." The success of portable water in the nineties hinged on the mind-set, established in the seventies and eighties, that it was okay to buy-and then toss-single servings of soda while on the go. In 2006, Americans consumed an average of 686 single-serve beverages per person per year; in 2007 we collectively drank fifty billion single-serve bottles of water alone. An entire generation is growing up with the idea that drinking water comes in small plastic bottles. Indeed, committed tap-water drinkers are far more likely to be older than devoted bottled-water drinkers. In Consumed: How Markets Corrupt Children, Infantilize Adults, and Swallow Citizens Whole, Benjamin Barber argues that consumer culture has turned adult citizens into children by catering to our narcissistic desires and conditioning us to passionately embrace certain brands and products as a necessary part of our lifestyles. Is it narcissism that pulls people into stores the second they feel thirsty? Or is it a need for emotional succor? City dwellers walk down the street swigging; they stand in conversation and mark time with discreet sips. You see it in lines at the movies and in cars on the freeway. (But only in the United States, Michael Mascha, the bottled water expert I'd enticed to sample water with me, says. "In Europe, no one walks down the street sucking on a bottle of water. We wait and we have a nice meal.") Surely these people have access to water at the end of their journey and are in no danger of desiccating on the spot. No, this is water bottle as security blanket. "I beg your pardon I never promised you a rose garden, Along with the sunshine there's gotta be a little rain sometime.."
Someone thinks that song is about Rudd. At the Press Gallery Midwinter Ball on Wednesday night it was chosen to introduce the Prime Minister, who then gave a wonderfully funny well-judged self-deprecating speech. "The two words most commonly used about Rudd's office are chaotic and dysfunctional. One only need drop by to have that confirmed. " Here's the full thing and the accompanying story. Lyons wrote about Hawke's office years earlier. I can say that I know of nothing that suggests Lyons is wrong, and several things that confirm what he is saying. I'll also say that Rudd is a clever man, more than capable of getting everything working smoothly. I am sure that he will, in plenty of time. In the ACT, an independent regulator sets the maximum price that the dominant supplier ActewAGL can charge. ActewAGL stands for ACT electricity and Water - Australian Gaslight Company, and is a distribution operation jointly owned by the ACT government and AGL. Ever wondered how much you are worth to ActewAGL as an electricity customer? Exactly $20.84 per year, according to the company itself. It has told the Independent Competition and Regulatory Commission that that’s how much it would be prepared to pay in marketing and other costs to keep you. In an odd piece of circular logic it had asked the Commission to let it increase electricity prices by an extra $20.84 per year in order to allow it recover that cost. to discount more than would ActweAGL in order to get and retain business. with their incumbent retail supplier”. active participants in the market”. be charged by ActewAGL is only the beginning. savings and cut their prices further. period if costs turn against it. electricity that households generate and sell to it. guide it says it would regard any cost below $250,000 as trivial. rising worldwide energy prices than to drought. steam. At full capacity it goes through 600 litres of water per second. report from 10.38 per cent to 7.1 per cent. Oil: Guess what? High prices cut sales. Australia’s oil imports have collapsed under the weight of higher prices and the resulting changes in consumer behaviour. Trade figures released yesterday show that just 1.6 billion litres were imported in May – well down on the long-term average of 2 billion litres per month. May volumes were down 28 per cent on those imported a year earlier. The change gives heart to those who have claimed that the higher prices that will flow from Australia’s planned emissions trading scheme will cut greenhouse gas emissions. The claim has been contested by the Coalition whose environment spokesman Greg Hunt has asked how “whacking a great new 20-cent tax” on petrol would cut emissions. The May plunge in oil imports was the biggest annual decline in four years. It is consistent with other information showing that the number of litres bought per person and the number of kilometres driven has been falling. Westpac Economist Matthew Hassan has calculated that in the three years since the oil price began to climb the typical amount spent on petrol jumped from $13.50 per week to $16.90 while the number of litres bought fell from 13.5 litres to 12.9 per week. The average distance driven per car fell from 14,600 kilometres per year to 13,800 kilometres in the five years to 2006. The results echo those in the United States where in November the number of cars on roads slipped below the level of a year ago. The latest figures for March show that US drivers traveled 11 billion fewer miles than a year before. The 4.3 per cent drop is the biggest-ever year-over-year drop in distance driven. The Wall Street Journal has labeled the phenomenon a “tipping point”, meaning that the price increases have become severe enough to have an effect. “What we are seeing now is prices have been high for a while and consumers have become convinced high prices are here to stay. That has given them time to make changes, such as the car they buy," the Journal quoted University of California, Davis economist Christopher Knittel as saying. CommSec’s Chief Equities Economist Craig James said that while oil imports had been slowing for six months the size of the May decline showed that Australians had dramatically changed their behaviour. “Fewer trips are being made in the car, more people are walking to the shops and using public transport and transport operators are making sure they fill gaps in loads to make less trips,” he said. The change had been anticipated by the head of the government’s climate change review Professor Ross Garnaut who told the Canberra Times earlier this month that he expected the current “exceptionally high fossil fuel prices” to have a strong effect in cutting emissions by themselves. So strong would be the effect that an emissions trading scheme might now not be needed in order for Australia to meet the 2012 emission targets imposed on it under the Kyoto Protocol. “We probably were in a position where we were going to more or less meet our Kyoto targets but now we will be more or less under,” he said. He suggested that when the scheme is introduced in 2010 the price of emissions permits be fixed rather than floating for the first two years in order to avoid the price of the permits falling to zero. Black Mountain Tower is a monument - but not of the type its creators intended. Do you ever think about why it’s there? There’s not much reason now. But back in the early 1970s microwave transmission towers were vital. They were the main means by which telephone calls and television programs were relayed between Sydney and Melbourne. Canberra was an essential stop along the way. The planners at what is now Telecom could see the need for microwave transmission facilities increasing rapidly and so, thinking big, they planned a monster tower – a design statement that would rise high above the national capital and provide for all of the intercity links that Australia would need. All of Australia’s television operators began sending their programs around the country by satellite. The iconic tower, which was designed to be an essential part of the process of distributing television programs, instead suffered the indignity of having a small satellite-receiving dish placed next to it so that it could receive them for rebroadcasting to a local audience. And then the laying of huge amounts of optical fibre cable between Sydney and Melbourne made the telephone transmission part of its role irrelevant as well. Black Mountain Tower stands as a monument to the futility of building really big for the future - one the present Communications Minister Steven Conroy would be well advised to ponder. The “richest” of the Rudd government Ministers, Senator Conroy has been given the right to spend $4.7 billion of our money building a national fibre-to-the-node broadband network, something he cheerfully says will “rival the Snowy Mountains Scheme in its scale and significance”. Submissions from companies wanting to help build the network are due by the middle of next week. Although the Minister has set up a panel of experts to help him assess the submissions he has been quite specific about the technology he wants. It has to be fibre-to-the-node or fibre-to-the-premises. This means that an optical fibre has to go to within a few hundred metres of each house or office, with the remaining metres able to be covered by the existing copper phone lines. He has specified a minimum download speed of 12 megabits per second, which is about 12 times what most of us could get a year ago, and said he wants 98 per cent of Australian homes and businesses reached. Oh, and it all has to be done within five years. For a start the ground could move from under him, just as if did from under the planners of Telecom’s Black Mountain Tower. In fact it is almost certain to. Back in the 1970s and 1980s technological developments weren’t happening that quickly. Right now they are raining down upon us at lightening pace. Anyone who specifies a particular technology, as the Minister did when he launched Labor’s $4.7 billion fibre-to-the-node promise in March last year, is highly likely to find that it is superceded or made redundant by the time it is built. Oddly, it looks as if the main competitor to fibre-to-the-node will be copper itself. The existing wires that connect most of our houses to the exchanges are proving far more useful than ever would have been thought. Three or so years ago they could only carry half a megabit per second (which we used to call broadband). Now they are easily doing 2 megabits and up to 12, and there is talk of them soon carrying 50 – which is far more than is needed for television. It is happening because ever more ingenious ways are being thought up to use radio waves to send vast amounts of data from one end of a copper wire to another and to correctly decode them at the other end. The technology isn’t a new type of cable. (Copper is turning out to be incredibly versatile.) It is a new way of using the cables we have. And by comparison with Conroy’s $4.7 billion spending plans it is cheap. It may be that one day we will reach the limits on the use of the copper that already connects our homes and that one day we will seriously need something faster. But neither has happened yet. And with technology evolving as quickly it is there is an excellent case for waiting. Anyone considering buying any piece of equipment right now is well advised to wait if they can. It is sound financial advice. In a report for the Committee for the Economic Development of Australia last year Professor Joshua Gans referred to it as the “late adopter” strategy. By contrast, the Communications Minister has a “build it and they will come” strategy. His speeches continually refer to future uses for the planned $4.7 billion high-speed broadband network that he says will evolve after it is in place. Are the Senator’s plans making you feel uneasy? They might if you had heard the Governor of the Reserve Bank Glenn Stevens speak in Melbourne on Friday. He told a business audience that in order to make room for some of the big infrastructure investments on the horizon he might have to push up interest rates. As he put it, “in most economies, it is usually not possible, and certainly not prudent, to try to have a consumption boom at the same time as an investment boom”. The Senator’s $4.7 billion spending program - to be matched or more than matched by a private partner - could be worse than redundant. It could push up inflation and interest rates. Think of what’s involved. Rewiring the cables going into nine million houses would require enough skilled workers to disconnect and reconnect cables at footpath pillar boxes at the rate of 5,000 per day - every day for five years. And that’s only part of it. In terms of the strain it would put on our resources it would indeed rival the Snowy Mountains Scheme. But the result might be a more dangerous version of the Black Mountain Tower. Peter Martin has a lovely column in today’s Canberra Times, using a metaphor that will appeal most to his local audience. Pointing out that the Telstra Tower was rendered unnecessary within a few years of its construction, he asks whether Labor’s plan of fibre to the node really is smart public policy. This reminds me of the Woodrow Wilson School at Princeton, which spent hundreds of thousands of dollars in 2000 outfitting each seat in its classrooms with an ethernet port. A year later, wireless took over, and they issued all their students with a free wireless card. A year after that, all new laptops were wireless capable, and they stopped issuing cards. So far as I know, the ethernet outlets were utilised for about nine months. By contrast, the Communications Minister has a “build it and they will come” strategy. His speeches continually refer to future uses for the planned $4.7 billion high-speed broadband network that he says will evolve after the network is in place. One little correction, believe it or not my report was written and released in 2006. Somewhat amazingly it still doesn’t seem to be obsolete. ...in Monday's SMH and Age. I reckon we'll avoid it, this time. "This is where I stick my neck out. My bet is that the economy is slowing, it will continue slowing, it will slow by at least as much as the Reserve Bank is seeking and probably more. In short, if our luck runs out we'll slow to the point of recession. If we do reach that point, my bet is the recession will be a severe one. If I'm anywhere near right, concerns about inflation will soon evaporate, as will the financial markets' expectations of more interest rate rises to come. The evidence that the economy is already slowing quite sharply is now strong. Retail turnover has shown negligible growth in the first four months of this year. Are you finding it hard to buy a house in Canberra? Does it seem to you as if the people who own houses want far more for them than they are actually worth? They almost certainly do, and a cutting-edge experiment using brain scans has just told us why. The team led by Brian Knutson from Stanford University couldn’t actually scan the brains of people who were buying and selling houses. It would have been too hard to wire them up to the equipment. So instead they wired up 24 right-handed students in a lab and gave them two desirable electronic goods as a gift and also $60 in cash. Told the real price, the students were then were able to decide to go ahead with the transaction. The team noticed the expected “endowment effect”. People were more reluctant to part with things than they were keen to buy them. As one of the researchers put it: “We might only pay $35 for an iPod nano, but we won’t sell it for less than $70”. It had been thought that this was because when we get hold of something it becomes more valuable to us – a perfectly understandable if somewhat irrational way of thinking. The researchers expected to see different behaviour in the part of the brain that deals with trading depending on whether the students were buying or selling. In fact they found that that part of the brain looked much the same, regardless of whether the student was buying or selling. But what did look different was another part of the brain, the insula, which is normally associated with pain. The “pain centre” lit up on the scans as soon as a student thought about selling. In fact the more a student liked the good that he or she was thinking about selling the more the pain centre lit up. Selling something we already have, especially if we like it, seems to cause us something close to physical pain. That’s probably why so many Canberra houses offered for sale are remaining unsold or are passed in at auctions right now. One US study found that owners typically want 12 per cent more for their houses than the market price. During a downturn they want 33 per cent more. It mightn’t be because they are greedy. They might be in pain. Saturday Forum: What's up with petrol?